Broome is located on the Western side of Australia and features rugged coastline, pristine beaches and gorgeous sunsets. Things to do in Broome range from hiking and swimming to four wheel driving tours out into the remote Kimberley region of this great land. Here are the top ten things to take in while touring Broome and it’s immediate area whether you arrive via a cruise vacation to Australia or not. Willie Creek Pearl Farm. As Broome has a rich history in pearling this pearl farm is a must see. 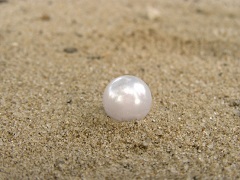 Learn what it takes to find the oysters and how they make the beautiful pearls we see today. Windjana Gorge and Tunnel Creek tour. This two-day excursion via four wheel drive vehicle takes you into the wilderness in the remote Kimberley region, just outside of Broome. crystal clear waters below and take in the sights like you can only do from the air. Cable Beach. One of the best things to do in Broome, this beach is full of golden sand and crystalline waters. A marvelous place to swim and relax as you take in the pristine surroundings. Roebuck Bay. If you go March-October and the weather is just right, you can see the moon’s remarkable designs on the mud flats. Called the ‘Staircase to the moon’ this magical experience shouldn’t be missed. Cape Leveque tour. This four wheel drive tour takes you to the Cape and to an Aboriginal village where you can swim, relax, and learn about Aboriginal culture. Camel Rides. At sunset, on Cable Beach, the camel rides are a must to check out and will be one of the more unique things to do in Broome that you can find. Gantheaume Point. This amazing trip will allow you to stand in the footprints of the dinosaurs. Literally, as it is a spot where many fossils have been uncovered. Aussie Rules Football. If you have never seen a game, Broome has two teams so you can take in all the action firsthand. Markets. Broome has many talented artisans who sell their wares throughout the year. Check these markets out for one of a kind souvenirs of your trip. Australian cruises stop at Broome to showcase the rugged landscape and the sparseness of the area. With so many things to do in Broome and its surrounding areas, you will soon realize why it is one of the most popular Australian ports of call.